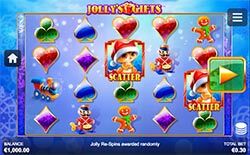 Review of: Unwrap winnings in Jolly's Gifts slot at Slots Promo! Peek under the Christmas tree to see what the cute Jolly left waiting for you in Jolly's Gifts slot machine by Side City and NextGen! This fun new game comes with colourful symbols and a payout percentage of 95.710%. Spin across 40-lines and win extra big rewards with Jolly's Wild Re-Spins, Mystery Gifts and Free games! Peek under the Christmas tree to see what the cute Jolly left waiting for you in Jolly’s Gifts slot machine by Side City and NextGen! This fun new game comes with colourful symbols and a payout percentage of 95.710%. Spin across 40-lines and win extra big rewards with Jolly’s Wild Re-Spins, Mystery Gifts and Free games! Jolly’s Wild Re-Spins – Jolly expanded wild appears randomly in the game awarding up to 5 re-spins. You will be guaranteed wins on the last 2 re-spins. On each spin, Jolly will leave 1 to 3 wilds on the reel. After any applicable re-spin wins are paid, the wild reel moves one reel to the left and another re-spin is awarded. Jolly’s Mystery Gifts – Gifts open to reveal other symbols in the game except scatters. During free games the gift box symbols are replaced by wild symbols. Gift boxes may appear stacked on all reels during normal mode. Free Games Feature – Land the Kitty in the Christmas Hat symbol anywhere on reels 1, 3 and 5 to win 12 free games.